Sharing our 20 Years of Beauty Treatment experience with you. Sharing our 25 Years of Beauty Treatment experience with you. Whatever your requirements are…We will always have the perfect treatment for you. We have been providing quality beauty and holistic treatments for over 20 years, using only the highest quality products such as Dermalogica, Bio Sculpture and St Tropez. We always provide a friendly, personal but professional service, whether you are visiting for a quick Eyebrow Shape or a full 3 hour Pamper Package. Located at Basingstoke Aquadrome, there is always ample safe free parking whatever your appointment time. Our hours of opening are Tuesday – Saturday 09:00am – 20:00pm. We offer an extensive range of Holistic and Beauty Treatments. Our Holistic Therapies, whether it be Aromatherapy or Reflexology, concentrate on balancing and energising the body through touch and aroma. healing the body from the inside out. Our Beauty Treatments, range from Facials, Waxing, Manicure/Pedicures to Relaxing Massages. Gift Vouchers make the perfect present. 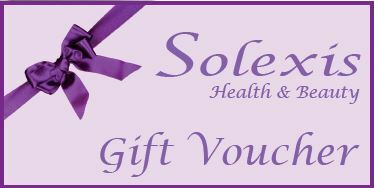 Choose the Treatment or the amount you want to spend and purchase one from Solexis Health & Beauty. Whatever treatment you decide to have, you will leave feeling stress free and peaceful.